The Vancouver condo market continues to push upwards, despite a cooling detached market. The average price per square foot inched upwards by a meager 0.5% from August and now sits at $1017 per foot. Here’s how the numbers shake out (View August Report Here). Vancouver condo sales increased by 21% on a year over year basis. Although I don’t like comparing to September 2016 because it was right after a foreign buyers tax. However, foreign buyers tax aside, Vancouver condo sales were still 19% above the ten year average for the month of September. Vancouver condo new listings increased by 3.5% on a year over year basis but were still 13% below the ten year average. While the increase on a year over year basis was much needed, we will need a continued increase of new listings to help replenish current inventory levels which have been pillaged by an excess of buyers. 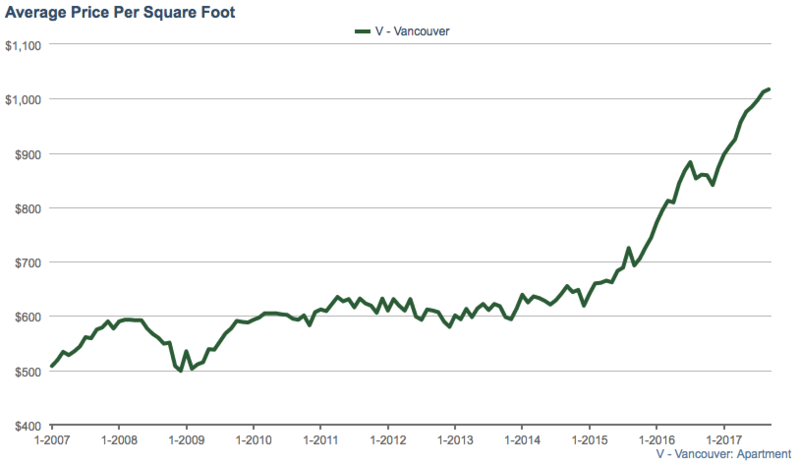 Here’s an updated image of Vancouver condo inventory levels. Down 34.5% year over year and obviously part of the reason for the flurry of bidding wars. 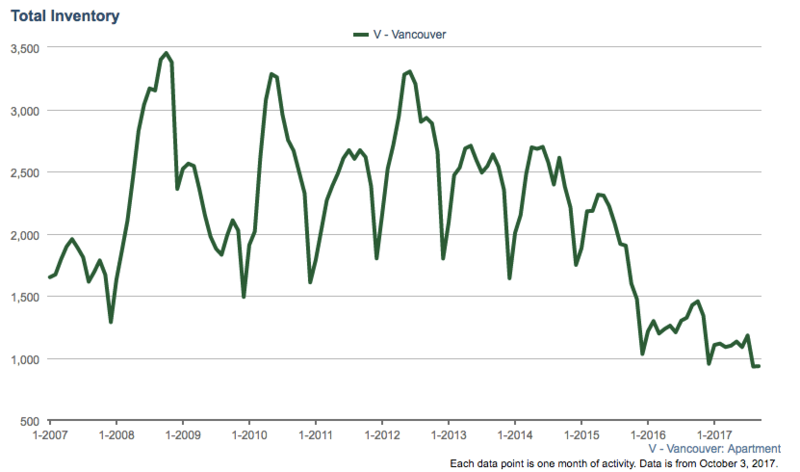 Vancouver Condo Inventory falls 35% year over year in September. The average sales price ticked upwards in September to a new record high of $872,486. An 18% increase year over year and a 13% jump since the start of the year. Vancouver Condo Average Sales Price hits $872,486 in September. The Vancouver condo market continues to be flooded with buyers who are competing amongst record low inventory. 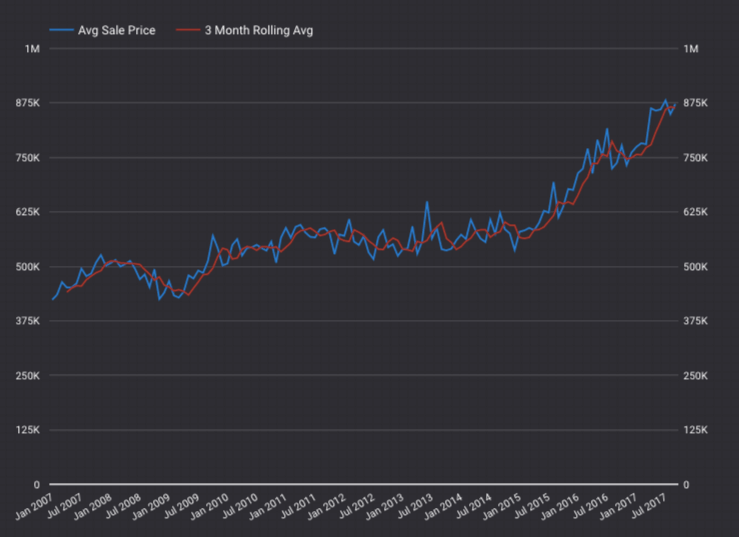 With the sales to actives ratio still at a whopping 57% there’s no sign there’s any price relief coming to buyers, at least for the time being. As I mentioned last month, there’s no question this kind of price acceleration is unsustainable, although I don’t see anything in the short term slowing it, other than an OSFI mortgage stress test in the next few months.